Scroll down to see our selection of Walkers for sale. Discount prices on a very large selection of walkers. We have the traditional walkers, rollator walkers, rolling walker, wheeled walker, the Merry Walker, folding walker, platform walker, walker with seat, hemi walker, 4 wheel walker, 3 wheel walker and many other handicap walker designs. If you are looking for a medical walker or walker accessory you have came to the right place. We carry the popular Guardian walker, Lumex walker and Invacare walker on this site as well as many other walker on wheel configurations for the elderly walker. 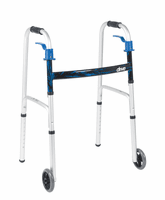 Wether you are looking for a walker on wheels or a more traditional handicap walker we probably have it on this website. We have many custom hard to find walkers that you just can't find anywhere else. Compare our prices and we are sure that you will do business here.